We have great new things for you to see. Come meet your new best friends and discover what makes Gund® irresistible. After all, they're stuffed with love. Don't forget to get yourself on our E-mail Newsletter, just write to us. For a limited time, Pooh is on Promo, Christmas Sweater Pooh no less! Welcome to the World Wide Rewards Program of which Bear St. is a sponsor. Come join in the Rewards! Bear St. welcomes The Kosen studio-haus! Direct from Germany, come see their fabulous selection of lifelike, ever-so-soft plush animals. New on the WWW! Planning a Corporate Event? Bear St.'s got your solution! 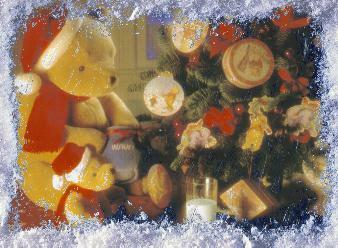 Christmas Collectibles are now at Bear St! Washing Instructions! How to clean your Gund. Bear St. Awards and Kudos. What YOU'VE been saying!! Please ask us about our 'Bear Away' program, or just click! For great gifts, the gift guide is the perfect place to start! Go To PacificaBlue and more stores!